Does the character look normal? Why is Iceland all alone D:? does the character have an awesome pet puffin? Poor Prussia and Iceland ^^"
I got leichinstein, this is so cool poor iceland! And I guess "Iceland-sama" is too great to just be categorized with all those common nations. "What is the character's gender? Not sure." XD Poor China, Poland, and Lithuania! It's awesome but...zoomed in I can barely read it. I'm having to squint to see what I can. If I was a man. . . I would be Russia-sama. o.o. But, being a girl, I am apparently Liechtenstein. Végre egy magyar a láthatáron! *victory dance* WOO HOO! I GOT KOREA, DA-ZE! Guys, Poland, China and Liet are all male. It's just that upon seeing them for the first time most people wouldn't be sure of their gender. 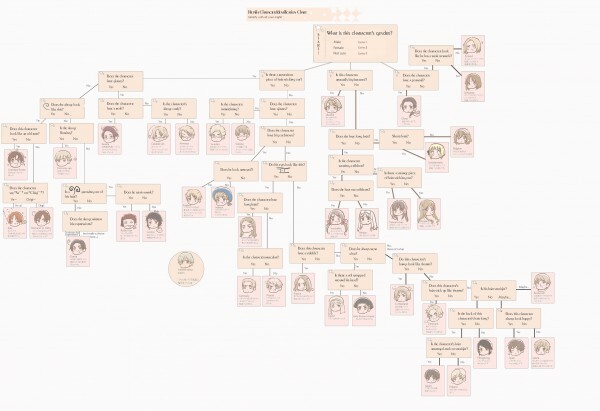 This is a character identification chart so that you can tell what character it is if you only know what it looks like. Oh, and I don't feel bad for Prussia. I prefer the skinny types to the muscular types anyway (not that I am implying anything; his character annoys me). Anyway, I'm Belgium apparently. As a boy I'd be Finland. If I follow the boys' side, I'd be Denmark... Pretty accurate. On the other side, Liechtenstein. Nope, her hair is too long. Took the boys one, I'm America. Took the girls one, I'm Belgium. Took not sure, I'm Poland. The universal Hetalia character analyzer.